How often do you find yourself doing the following instead of prospecting? Shannon Goodson and George Dudley wrote a book several years ago called, The Psychology of Sales Call Reluctance. They interviewed over 11,000 sales people. 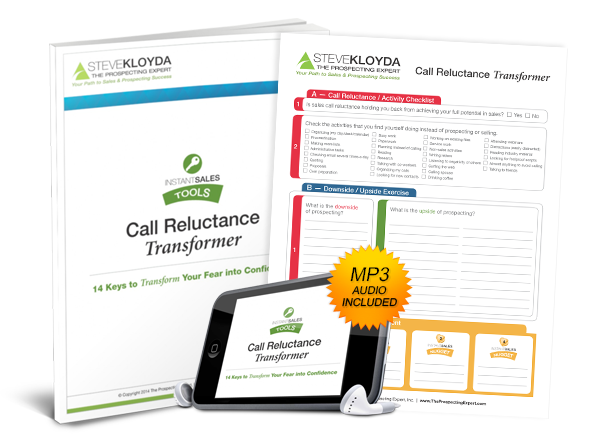 80% of all new sales people fail because of Call Reluctance. 40% of all veterans stop prospecting because of Call Reluctance. You will make 5 times less money because of Call Reluctance. 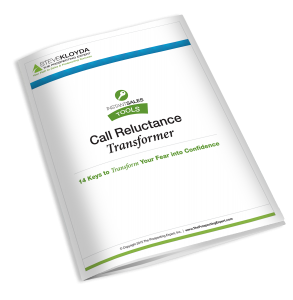 As you can see by the statistics above, sales call reluctance is a huge problem. I have devoted the past 24 years of my life helping salespeople solve this Major issue and I want to help YOU. Don’t become a statistic and defeated by sales call reluctance! “Stop the madness now!” ~ Mr. Wonderful on Shark Tank. 14 Keys to transform your Fear into Confidence. Transform your fear NOW and drive more sales! Brought to you by Steve Kloyda, The Prospecting Expert. For more than 30 years, Steve Kloyda has been creating unique selling experiences that transform the lives of salespeople. In addition to facilitating thousands of workshops across the country; he has personally made more than 250,000 sales and prospecting calls, listened to and analyzed more than 25,000 sales calls and facilitated more than 6,000 one-on-one coaching sessions.